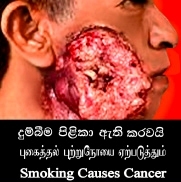 Sri Lanka is ranked sixth in the world, with graphic health warnings covering 80 percent of tobacco packages. The report and ranking come just days after President Maithripala Sirisena addressed representatives of some 180 countries at the Seventh Conference of the Parties to the WHO Framework Convention on Tobacco Control in India. Campaign for Tobacco-Free Kids of the US president Matthew L. Myers, states that a remarkable progress had been made around the world to ensure that the public knows the deadly truth about tobacco use, the world’s leading cause of preventable death. “More than half of the world’s population now sees warnings on tobacco products that accurately portray the deadly consequences of tobacco use. Glossy images and appealing designs are being replaced by pictures of diseased lungs or even plain, drab packaging in more and more countries,” he said. On November 10, 2016, the Canadian Cancer Society, released a status report which finds that more than 100 countries have required graphic warning labels on tobacco products - a lifesaving measure that now impacts more than half the world’s population. The number of countries requiring graphic warning labels had steadily increased over the past two years. The report, which ranks 205 countries and territories based on the size of warning labels required, demonstrates the tremendous progress that is being made in addressing the world’s leading cause of preventable death. Around the world, tobacco companies depend on package design to build brand recognition and promote sales. Packaging establishes brand imagery that is often completely opposite to the realities and dangers associated with tobacco product use. But the new report shows that countries are largely acting to limit the tobacco industry’s use of packaging to lure in new users. The report shows outstanding progress – and sends a strong message to countries around the world that the time to take strong action to reduce tobacco’s deadly toll is now, ” Myers said.